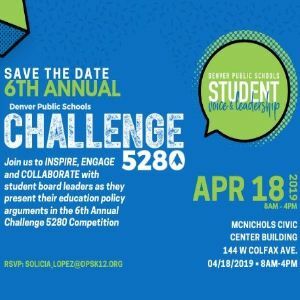 Join us to INSPIRE, ENGAGE, and COLLABORATE with student board leaders as they present their education policy arguments in the 6th Annual Challenge 5280 Competition. The program begins at 8am, but join us at 7:30 for breakfast! Student Exhibitions: Interact with teams!